Everyone gets injured from time to time. You can prevent complications and speed recovery by following these simple guidelines. The acute stage of injury lasts from the time of the injury to about 4 days after it occurred. The body reacts through inflammation (swelling), muscle spasm and sometimes inhibition (avoidance of contraction) of certain muscles. The injury feels swollen, hot and painful. Protection: It is important to protect your body from further injury. For example, walking on an injured ankle can make it worse. However not using the body at all can cause more problems by making your body stiff and weaker. You should move your body as much as you can without worsening the pain and swelling of the injury. This relaxed movement of the body helps to keep structures from getting glued to each other as the injury resolves. It also lessens deconditioning which makes us weaker when we don’t move our bodies at all. That being said, you may need to wrap or splint the area to protect it from further injury. Relaxation: It is important to relax during this period of time. Relaxation primes your body for healing. For example, pain and tension often cause us to breathe using our neck and shoulder muscles. If you have suffered a neck injury, then this pattern of breathing can prevent these muscles from getting a chance to recover. Relaxation brings on diaphragmatic breathing, which gives your neck and shoulder muscles a chance to relax and recover. Relaxation also deepens and strengthens the contraction of your lymph vessels. The lymph vessels carry away by products of inflammation and injury. When you relax, your lymphatic system works more enthusiastically to reduce swelling and decrease pain. Ice is usually applied during the first 48 hours to decrease inflammation and control pain. Cold can be applied by using a cold pack, ice cubes or even frozen peas! If using a frozen water source of cold, it should not be placed directly on top of the skin as this might cause frostbite. Have a thin towel or t-shirt between your skin and the bag of ice. Cold therapy can be applied for a few minutes, up to 10 minutes. You must make sure that the skin and underlying tissues do not begin to freeze. This is done by combining your internal sense of the tissue with looking at the tissue and feeling it. The ideal endpoint for an inflamed muscle is that it should be numb from the inside. When feeling the chilled area with one of your hands you should feel that the tissue feels like steak that has just come out of a refrigerator. At this point, most if not all of the pain sensations from the area should be shut off. You should have this feeling for at least a few minutes before you take the cold therapy off. This will give you a maximum anti-inflammatory effect, turn off pain signals (for minutes up to a few hours) and give you a nice therapeutic flushing effect after the cold has been removed. Compression and/or elevation are applied to decrease inflammation and encourage swelling to dissipate by encouraging it to flow towards the heart. Compression may be achieved by wrapping the injured part (an ankle, for example) in a tensor bandage. Elevation is achieved by placing the injury on a pillow or pillows so that it is higher than the heart. Massage directly on the injury site is not a good idea at this time, but massage in other areas can help you relax as well as work the knots out of muscles that are tight from protecting the injury. Lymphatic and other light massage techniques can often encourage the flow of swelling away from the injury site. The sub-acute stage of injury lasts from 4 days to 2 – 3 weeks after the injury. This is the repair and healing stage. During this time your body is absorbing the swelling at the injury site. Consequently, there should be much less swelling at the beginning of this phase and little or no swelling at the end of the phase. How you are moving the injured part is influencing how well it will recover. Movement controls the alignment, strength and flexibility of scar tissue. If you are guarding or inhibiting your movements at this stage, then you are setting yourself up for problems over the long haul. You need to move the injured part in a relaxed way, gently exploring the limits in range of motion. Massage manipulations can be gradually introduced closer and closer to the actual injury site. Now is the time to gently tackle all of the muscles that tightened up at the time of the injury. 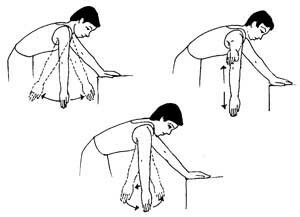 This can be done through stretching and/or massage manipulations. As muscles tone and length approaches the normal state, you will need to begin movments that gradually strengthen the injured part. The safest way to do this is initially with non-moving, muscle-setting efforts in which you gently contract the muscles that have been injured, without moving the joint. Toward the end of the sub-acute phase you may begin resisted movements in which you contract injured muscles against a moving resistance such as a dumbbell or exercise tubing. At this stage the general guideline is that exercise (or massage!) may be a bit uncomfortable at the time…but the discomfort should ease off right away or at most over a couple hours after the exercise or treatment. If increased pain persists or if there is increased swelling or pressure within the injury, then the movement or treatment has been too challenging and you should challenge your body a bit less next time. The chronic phase of recovery from injury lasts between 2 to 3 weeks and up to 6, 12 or even 18 months after the injury, depending on the severity of the injury as well as how well it heals.Stretching, resisted movements and massage therapy are useful methods for gaining full pain-free use of the injured part. It is also important to build up strength in the injured tissue that at least meets – if not exceeds – the pre-injury level of strength. Otherwise it is likely you will re-injure yourself.Strength may be built up by a variety of methods that challenge your muscles. It is important to have a safe program designed by a professional who understands both exercise and the demands your body needs to be able to meet; at home, in the workplace or in sport. Any compensation that your body has undergone to avoid pain or to adjust to stiffness needs to be worked out. For example, you might have shifted your weight over to the other side of your body when your ankle was injured. This causes an imbalance in the pelvis and all the way up the spine that may give rise to back pain, neck pain or even headaches. After abdominal surgery, the tendency is to avoid moving and stretching the abdomen in certain ways. This may cause you to draw your head forward and round your shoulders. This can set the stage for shoulder tendonitis, headaches and/or jaw problems! An injury to your hand will lead you to using the unaffected hand much more. This can build up tension and trigger points in the uninjured (but harder working!) side. This tension can climb all the way up to the shoulder and neck causing shoulder and neck pain as well as headaches. Your massage therapist is an expert at finding pockets of tension all over your body that might have arisen from compensation. Massage therapy, stretching and attention to a balanced posture can do a lot to work out compensatory patterns of tension and muscle use in the body. At this stage of recovery from injury, there should be no signs of swelling. Discomfort may occur as activity levels are increased, but it should not last longer than a couple of hours. Signs that treatment or activities are progressing too quickly are joint swelling, pain that lasts longer than four hours or that requires medication for relief.